Held each fall at the beautiful Forest Hill Cemetery in Madison, this award-winning living history programs illuminates the lives of many prominent and lesser known-figures in Wisconsin history. Tours will focus on the contributions of Wisconsin’s soldiers and citizens during the Civil War. Local actors and actresses don period dress, giving viewers a first person encounter through scripted vignettes. Tour guides lead informative discussions of the cemetery’s rich history during the 90-minute walking tour. Talking Spirits 2019 school group days information will be available late Spring 2019. Don’t want to miss out? 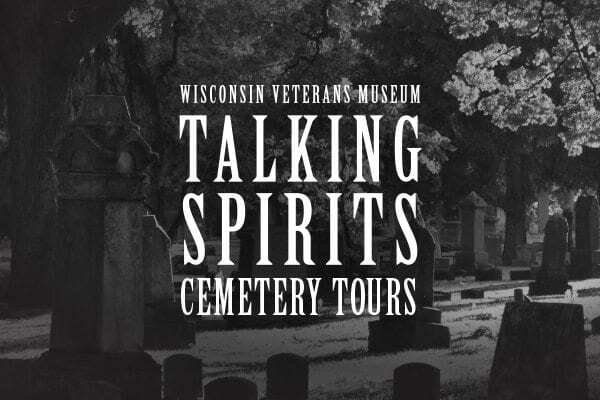 Click here to join our mailing list to receive updates on 2019 Cemetery Tours and other Wisconsin Veterans Museum events. James Bennett and Ella Bennett Bresee: James Bennett served under William Vilas in Company A of the 23rd Wisconsin Infantry Regiment during the Civil War. He was discharged on April 5, 1863, due to wounds he received on an expedition up the Arkansas River. Bennett reenlisted in Co. D, 37th WI Infantry on March 11, 1864 where he advance to first sergeant before being wounded at Petersburg, Virginia. He was breveted First Lieutenant and discharged in May 1865. His daughter, Ella was 3 years old. When she was just a child, her father and mother would take her to Forest Hill Cemetery on Madison’s west side to decorate the graves of the soldiers who were killed during the Civil War. In part, because of this tradition, Ella continued patriotic work throughout her life. During World War I, she volunteered for the Red Cross and started the first canteen service in Wisconsin. James and Ella’s story will focus on homefront activities and ways in which people remember and honor the men and women who fight. John and Hugo Stock: On July 10, 1848, eight-year-old John Stock of Bavaria, Germany landed in New Orleans, Louisiana and began the journey to Wisconsin. Sixteen years later he enlisted in Co. L, 4th WI Cav. to fight in the Civil War. Upon promotion to First Lieutenant, he was transferred to Co. C where he continued to progress through the ranks until he was mustered out of service as a Captain in 1866. In 1872, John married Selma Diehnelt, another native of Germany and they had eight children. The youngest son, Hugo, graduated from UW-Madison then joined the Wisconsin National Guard and served on the Mexican border. In 1917, he entered active service for WWI and excelled in his training to become a pilot. He advanced to Second Lieutenant and was killed on September 28, 1918 in Issoudon, France in an accident on the flying field. John, who was ill, died on September 30 never knowing that his son had died before him. The Stocks’ story will center around themes of legacy, duty, and obligation. Senator Robert M. La Follette: A former governor of Wisconsin and U.S. Senator since 1905, Robert M. La Follette spent the decades leading up to World War I as a Progressive reformer. His stance against U.S. involvement in the war emerged from his concern for the working class and while the war raged in Europe, he pressed for neutrality. La Follette was one of five senators to vote against entering the war and he continued his protests in spite of accusations of betrayal. He voted against instituting a military draft and he opposed the Espionage Act, predicting that it would be used to suppress free speech. He argued that free speech is even more important in wartime than in peace. Due to his unpopular stance, an expulsion petition to remove him from Congress was started but not long after the hearings were scheduled to begin, popular opinion changed again. Voters turned against Wilson in the 1918 elections, and Republicans won a slim majority in the Senate, making La Follette a swing vote. A week later, the war ended with an armistice and a German defeat. Later that month, a Senate committee voted against expelling La Follette. In the post-war years, he enjoyed growing respect for his anti-war, free speech stance. In 1923, after Wisconsin re-elected him, the Senate reimbursed him $5,000 for legal fees in his defense against expulsion – an acknowledgement that the case against him had been unfair. Senator La Follette’s story will explore the political climate during World War I and themes of free speech and standing for one’s beliefs. Clifton A. Bewick about Maurice O. Togstad: Maurice Togstad and Clifton Bewick were members of the WI National Guard 32nd Division. They arrived in France in early 1918 and Maurice was quickly promoted to first sergeant. He was awarded the Croix de Guerre and a Bronze Star for extreme gallantry in action in Alsace in May and was given a field commission to second lieutenant in early November due to meritorious service. On November 10, 1918, one day before the armistice took effect, a German bomb was dropped near Togstad and Bewick. Togstad lived for only a few minutes and a wounded Bewick was with him when he died. He was buried in a churchyard in Brehville and three years later, his body was exhumed and transferred to Madison for burial. The service was held at Bethel Lutheran, the same church where he was baptized as an infant. His mother, Mina was the first gold star mother to sign the charter application for the local Disabled American Veterans post named in part for her son. This story will be told from Clifton Bewick’s perspective and will cover themes of valor and loss.